Newly released data shows that the Oakland Police Department continues to disproportionately stop, search, and arrest African Americans. Jamie Soja/File photo OPD stops more blacks than members of all other racial and ethnic groups combined. On a winter night fifteen years ago, Gregory Nash sprinted across the intersection of 40th Street and Telegraph Avenue to catch a departing bus. A van ran a red light and nearly hit Nash. "I cussed them out," he recalled, throwing up a middle finger to illustrate. "Well, then the van pulls over and these cops jump out. One of them grabbed me, and he said, 'What's in that?' pointing at a bag I found at the bus stop." The cops then shoved Nash into the van, and smacked him in the face while another officer yelled racist epithets at him, he said. Police drove Nash to the boarding house where he lived, and he thought they were going to let him go. "Then this one cop pulls out a bag of [crack cocaine] rocks," recalled Nash, "and he says, 'What's this?'" Nash had been swept up by The Riders, a group of Oakland police officers who he says planted the drugs on him. The Riders scandal broke a few weeks later, and Nash, an African-American resident of West Oakland, went on to become one of the plaintiffs in Delphine Allen v. City of Oakland, the federal lawsuit that resulted in a negotiated settlement agreement that requires the Oakland Police Department to eliminate, among other things, racial profiling practices. Under federal oversight for twelve years now, OPD has made progress in meeting many of the mandated reforms. 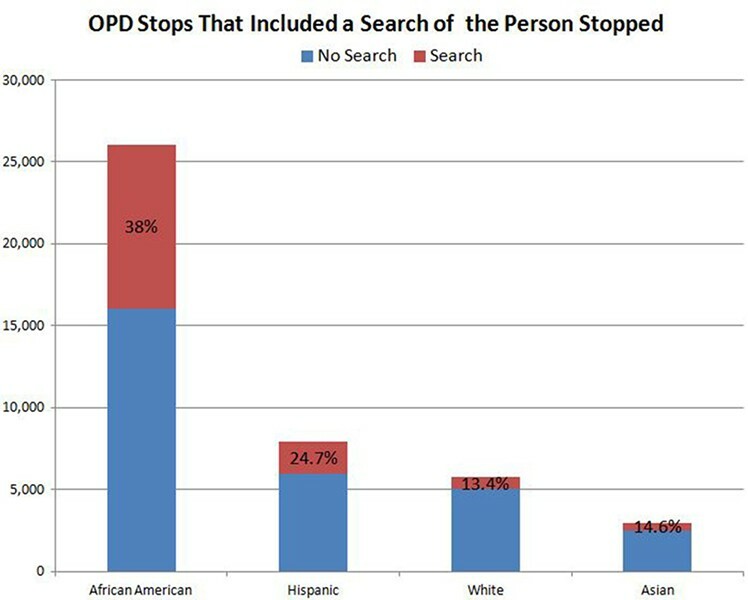 But newly released data reveals ongoing racial disparities in stops, searches, and arrests by OPD officers. OPD started collecting stop data in 2004, according to department spokesperson Frank Bonifacio, but a recently expanded effort began in 2013. The new data, which includes every vehicle and pedestrian stop made by OPD between July 2013 and June 2014, was first made public by the department in a September 2014 report that analyzed a sample of approximately 28,000 stops. The Express recently obtained an updated data set detailing approximately 44,000 stops conducted by OPD between April 2013 and October 2014. The updated data shows, unambiguously, that the majority of stops, searches, and arrests conducted by OPD were of African Americans. Of the 44,142 total stops, 26,049, or 59 percent, were of blacks. But blacks only account for 28 percent of Oakland's population. Latinos (who are classified as "Hispanics" in OPD's records) were stopped 7,910 times, making up 18 percent of all stops. 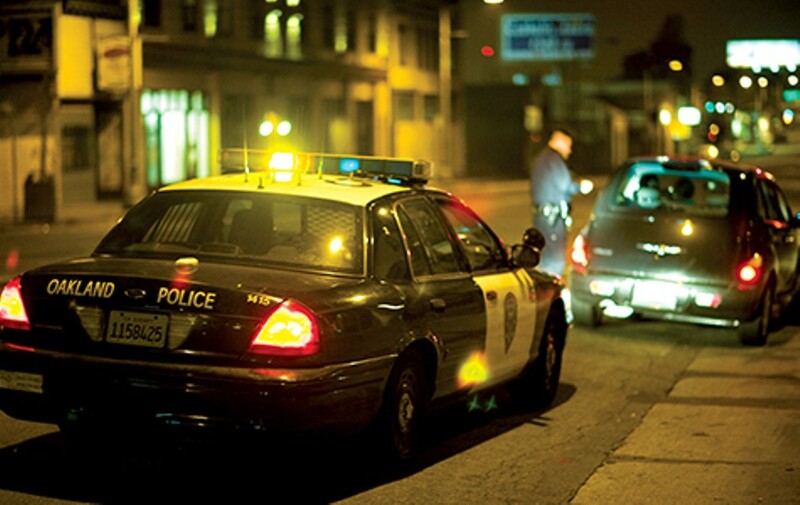 Whites, who make up 26 percent of Oakland's population, represented only 13 percent of the stops carried out by OPD. "We've made a lot of progress under the negotiated settlement agreement [NSA], but this is still a major issue," said Councilmember Desley Brooks. "It gives me tremendous pause to see African Americans stopped more than all other groups combined." Under the NSA, OPD requires officers to document their reasons for stopping pedestrians or vehicles. And the data shows that officers often claim they have "reasonable suspicion" and "probable cause" to stop African Americans in higher numbers and at higher rates than members of other racial groups. Of all stops initiated because an officer claimed to have reasonable suspicion, 73 percent were of African Americans, while only 8 percent were of whites. Similarly, 70 percent of all stops for probable cause were of blacks. Officers justified 32 percent of all their stops of African Americans as resulting from reasonable suspicion or probable cause, while only 19 percent for stops of whites were for the same reasons. Reasonable suspicion is the lowest legal standard an officer can employ to stop and detain a person without the person's consent. Officers have significant discretion in determining what qualify as suspicious behaviors and circumstances. Probable cause is a higher standard requiring an officer to have actual evidence that a crime has been or will be committed. The disparate impact of the criminal justice system on blacks is also evident in OPD's stop data. In 77 percent of all cases in which OPD said it stopped a person because he or she was on probation or parole, the person was black. Latinos accounted for another 12 percent of all probation and parole stops. Whites and Asian Americans, however, were only 5 and 4 percent of the total, respectively. 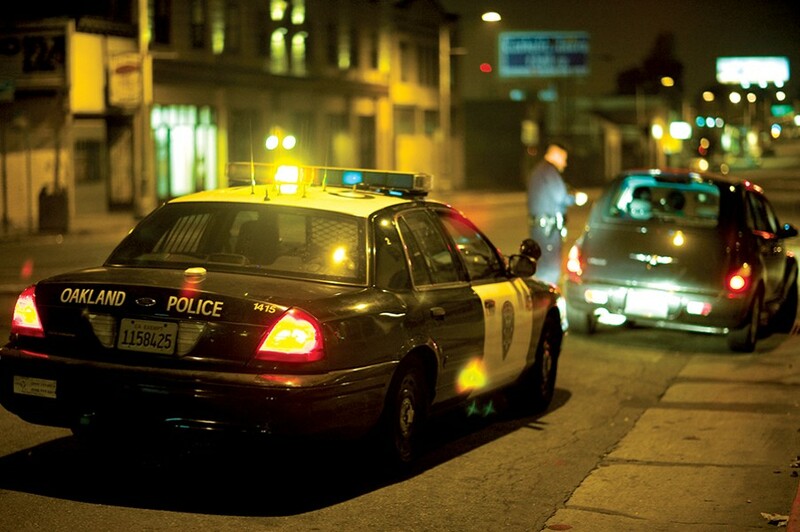 Alameda County Public Defender Brendon Woods reviewed both the Express and OPD's analyses of the stop data. Though California is three years into Governor Jerry Brown's "realignment" program to reduce prison overcrowding, Woods said Oakland's stop data makes it clear that the basic factors that drive the mass incarceration of people of color are unchanged. "This is the problem — it's staring us right in the face," Woods said. "From what we have here, it appears there is targeting based on race. The stats are so off the charts. There is a continual cycle where African Americans are stopped, they may or may not be charged, and a continual debtors prison that results from bail, bond, traffic citations — it goes on and on." Huge racial disparities are also apparent in the outcomes of stops. OPD's stop data shows that the number of African Americans who were searched by police was double the number of all whites who were stopped. In addition, blacks were three times more likely to be searched after being stopped than whites. Of the 26,049 stops of African Americans, 38 percent of them, or 10,015, resulted in a search. Over the same period, only 775 whites, or 13 percent of all the white people stopped by OPD, were searched. Stops resulting in an arrest showed similar disparities. Over the roughly 18 months of policing documented by the stop data, OPD arrested 4,223 blacks, 796 Latinos, 396 whites, and 214 Asian Americans. Three quarters of all arrests made by OPD after a pedestrian or vehicle stop were of African Americans, and 16 percent of all stops of blacks resulted in an arrest, while Latinos were arrested 10 percent of the time. Only 7 percent of whites and Asians stopped by OPD ended up being arrested. The reasons for the arrests were not entirely clear in the data made available to us. Woods said stop data is an invaluable tool for examining policing priorities and how people of different backgrounds are impacted by them. Oakland's numbers are alarming, he said. "I know the problem of racial profiling existed in Alameda County and Oakland, but I didn't know it was to this extent. "African Americans and Latinos make up 90 percent of felony arrests — there has to be targeting on a racial basis," Woods continued. "These statistics are off the charts when you look at arrests. The percentage of arrests involving blacks is three times greater than Oakland's African population." "The search percentages are completely out of whack for those two groups as compared to whites and Asians," said attorney James Chanin, who along with attorney John Burris brought the Allen case against the city. "The negotiated settlement agreement is not ending until disproportionate stops of blacks and Latinos are dealt with." Federal court Independent Monitor Robert Warshaw also raised concerns about the racial disparities in OPD's stop data in his January report on the department's federal reform effort. Warshaw's team conducted its own analysis of OPD's stop data, discovering that stops yielded contraband only about 23 percent of the time, across all racial groups. "The Department must address its lack of documenting justification for each search and the resulting low contraband recovery rate," Warshaw wrote. Warshaw also encouraged OPD to "expand its focus to the disparity of stop data by race." OPD is acting on this advice. "In June 2014, Stanford University Professor Jennifer Eberhardt was contracted by the Oakland Police Department to administer a stop data analysis project, designed to identify and address tensions between the Oakland Police Department and the Oakland Community," Oakland Police spokesperson Bonifacio wrote in an email to us. Bonifacio explained that OPD recently initiated training programs to address potential racial biases among officers. "We've done an implicit racial bias training for supervisors, and a second one for commanders, but we're just two months into it," he said in an interview. Stanford's Eberhardt is not only analyzing OPD's stop data, her team also has access to officers' chest-mounted camera footage documenting specific encounters. "She will analyze decision-making leading to the initiation of stops and actions during stops, as reported on Stop Data forms, other reports, and audio/video recordings," Bonifacio wrote. "Variables such as officer race, experience, and squad diversity will be factored into the study." "To better understand the context of the OPD's work, members of our research team have joined with OPD officers on ride-alongs," Benoit Monin, a professor of psychology at Stanford working with Eberhardt, said at a special meeting of the Oakland City Council on January 24. "Overall, Chief [Sean] Whent and Assistant Chief [Paul] Figueroa have given us extraordinary access to OPD data and we will be able to answer questions that no researcher has been able to ask before." Monin cautioned against reading too much into the raw statistics at a recent city council meeting. "The existence of wide racial disparity in stops is beyond dispute and widely publicized," said Monin. "But disparity alone is not evidence of wrongdoing." Monin said the Stanford team will drill down into the data to understand why there is a disparity. The Stanford team anticipates releasing its report this June. For his part, Gregory Nash remains skeptical about OPD's ability to change. "I think they're still profiling," said Nash. "But let's see some action."